I made notes on what we should prep for the next night, and also planned for the longer cook + prep time meals to land on the weekends when we have more time to spend cooking ( date nights!). So far this has seriously worked for us, we are loving the schedule! It can seem a bit over board, but for us, we need this discipline or else we’d be getting delivery and spending a ton of money on extra meals for lunches and the like all week long. This calendar has eliminated the question ” What should we have for dinner?” and ” Do we have anything to make for dinner?” and similarly ” What can we make for dinner?”. It’s like being back in school with teh lunch calendar in teh cafeteria, except this is good food, made at home, healthy! The recipes are all found through Jenny’s blog post but we’ll be sharing our versions here as well when we take pictures. Each has been super simple, fast, budget friendly and DELICIOUS- perfect combo for success. Now I just need to build in some time to work out and we’ll be golden. 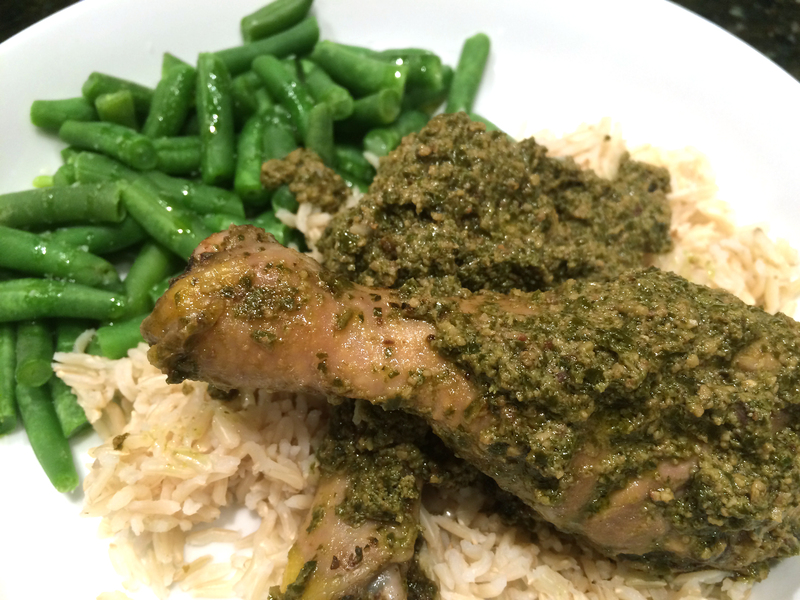 Today I am sharing the Pesto Chicken- I had frozen chicken legs and frozen homemade pesto already so that’s what I used. You can use chicken breast/ thighs, store bought pesto etc- I didn’t follow this recipe at all, but want to share it anyhow in case you’d like the baked on cheese yummified version here. Spray a foil lined 9″ x 12″ baking dish with non-stick spray for easy clean up, then spread 1/3 cup basil pesto over the bottom of the dish. Lay chicken over the pesto, then spread the remaining basil pesto over the chicken.